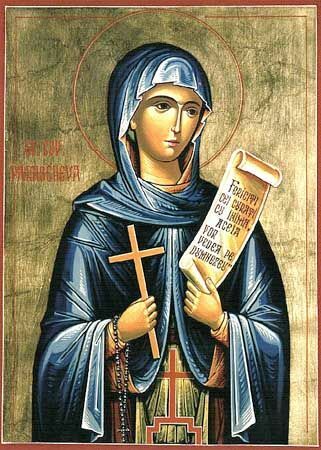 On October 14 the Orthodox Church celebrates Saint Paraskeva or also called Petka. They call this day still Winter Petkovden and Bulgarian beliefs marks the transition to winter. Bulgarian traditions and celebrations of this day are rooted from the time when human life principal place occupied fertility of the earth personified by a woman, giver of life. It is believed that St. Petka is a protector of home and family. From Petkovden begin preparations for engagements and weddings, as people understand the saint is the patron of birth and fertility, both in humans and in animals. Petkovden marks the end of the agricultural work - last autumn sowing and harvesting. To this day all agricultural work must be completed, so people say "On Petkovden plow you under the eaves." On October 14, celebrate and shepherds - then they put in sheep rams, then the shepherd's pie rests gift. After Petkovden to Demetrius (October 26th), during the fertilization of domestic cattle, women should not work with wool and scissors tied with red thread - "to not open the mouth of the wolf", also to knit, not fouling chitterlings of lambs. According to legend, women who do not respect this decree will be visited by Petka - in the form of a snake or wizened woman who wants to die. It is believed that if a person dressed garment sewn in the days between Petkovden and Dimitri will be mad or sick, then his death will become a vampire. After fertilization, traditionally, women baked fresh bread and hand them out to be born healthy cattle. Petkovden considered a watershed in some corners, observe the custom of "useful". According to him, any person you first set foot in the house, determined luck and health throughout the year. Days of Petkovden to have Demetrius mythical sense corresponding dirty stroked days. These twelve days called "wolf or vampire stroked" are sacred boundary between the old and the new year. In these days of bizarre and esoteric creatures roam the land and the human world is a chaotic and dangerous. In different parts of Bulgaria on the Saturday before St. Petka noted Petkovdenska All Souls' Day, to commemorate the dead. The dealer podkovki sprinkled with boiled wheat, sweetened rice, watermelon and grapes. On Petkovden make generic offerings and ritual breads are kneaded, the largest called "Sveta Petka" put on the table on the man's shirt, salt dish and glass of wine. The house sprinkles holy water, ritual bread prekazhda and the whole family worshiped him three times. Then the oldest woman raises high the bread and blessed it all and handing out pieces. The table of Petkovden nice to have stew with mutton boiled mutton soup, stuffed vine leaves, tripe dishes with onions, ritual breads. If Petkovden sun is shining, the leaves have not fallen, and sheep huddle together - winter will be severe and snowy. Name Day celebrate: Paraskeva, Petko, Pencho and Petko, Penyo Penko, Parush, Petrich, Petra, Keva.